Land in Calgary and we’ll whisk you off to your luxurious hotel where an afternoon of relaxed wandering is in order to help you acclimatize. As night falls, make your way over to one of Calgary’s most revered restaurants, where we’ll have a table booked and waiting for you. Calgary is brimming with farmer’s markets, bistros and high-end restaurants that continue to grow and develop, so a food tour is a great way to get to grips with this city in the morning. Listen to your private guide as he tells the story of the different vendors in the markets and how the culinary scene here has exploded in recent years whilst keeping your eye out for some of Calgary’s famous landmarks and architecture. Full on both food and knowledge, head to the Glenbow Museum, with its varying art exhibitions, or visit Heritage Park Historical Village, where you’ll gain an insight into the history of the West that the whole family will love. From Calgary, it’s on to Banff National Park where you’ll hole up just a stone’s throw from Lake Louise. Once you’re settled in, it’s straight back out for a serene canoe paddle across the inviting waters of Lake Louise. The image of blue alpine waters overlooked by towering snow-capped peaks and dotted with wooden canoes is a famous one, so now it’s finally time you put yourself in the frame. Reach the center of the lake, stop paddling and simply look around at the stunning scenery that surrounds you. Experiences like this prove the beauty of slow travel. In between admiring the mirror-like surfaces of the area’s famous lakes (Moraine Lake being a particular favorite of ours), be sure to also make time for Banff Upper Hot Springs to enjoy some natural R&R. An area that the First Nation’s people once frequented, believing it to be a sacred place, tourists and locals alike now make the pilgrimage in order to bathe in the hot mineral waters and enjoy the unbeatable views. Jasper has many incredible highlights, but with only a couple of nights in this vast area, we’ve handpicked some of the best. 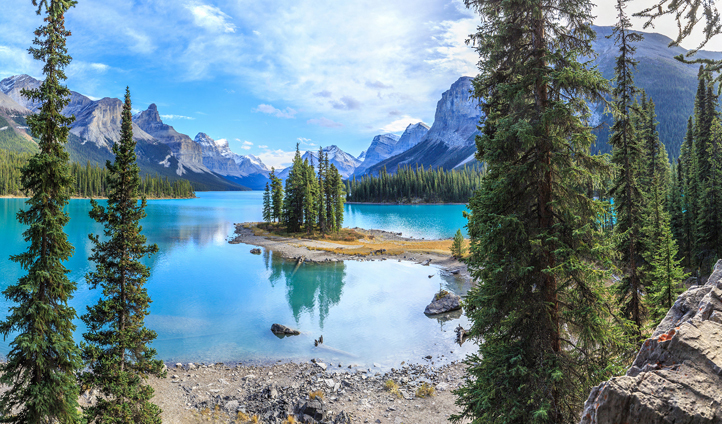 The heart of Jasper National Park; Spirit Island on Maligne Lake is only accessible by boat, so we’ll send you coasting along alpine waters that have filtered down from the Rockies, to hop out of the boat onto Spirit Island, which will prove to be a fantastic photo opportunity. Stood in the center of a lake surrounded by giant mountains, you’ll begin to realize just how small you are. Then there’s the world-famous SkyTram. The highest (and longest) aerial tramway in Canada, you’ll literally feel as though you’re being transported to the top of the world. A ground-breaking achievement for Jasper, this experience will truly leave you breathless. To wrap up this incredible adventure, its time for some more cosmopolitan vibes as you spend a night in Alberta’s capital city – Edmonton. Known as the Festival City, you might just be lucky enough to be in town for events like the Folk Festival or the Fringe Festival. If not, simply take time to wander the halls of The Art Gallery of Alberta for a spot of culture and immerse yourself in the color and bustle of the city’s farmers’ markets. Then, as night falls, make a toast to your epic journey through quintessential Canada at one of the many restaurants and bars along Edmonton’s wonderful Whyte Avenue.